Isabella Rose Celeste Davey is a Sagitarrian with a Piscean moon, who has written for publications including Twin, LOVE, V Magazine and Harper’s Bazaar Malaysia. 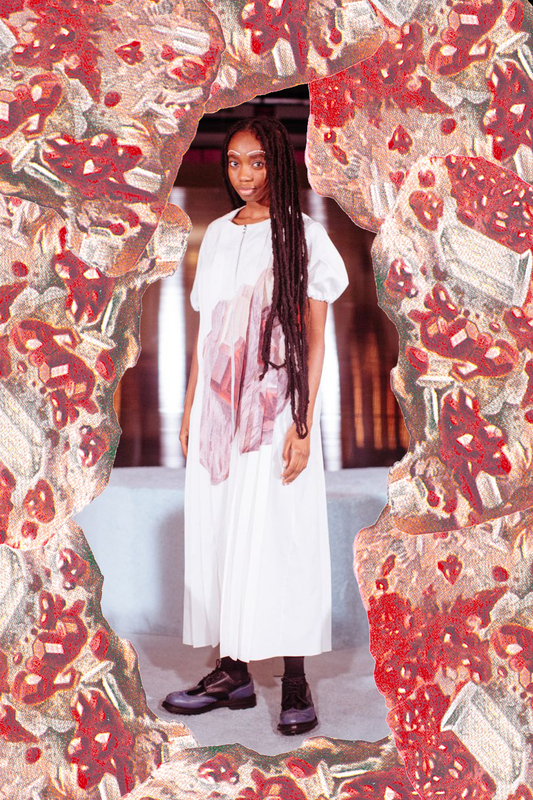 When not writing, Isabella works in Designer Relations for the British Fashion Council, where she helps build the official menswear and womenswear fashion week schedules and project manages the NEWGEN designer support scheme and Fashion Arts Foundation. We hope you enjoy Isabella’s thoughtful interview with one of our amazing London-based clients minki. The minki world is one of playful evocation, a starchy, oversized, ruched and colour-driven image of a woman in her own modern narrative. Having shown at London Fashion Week for the last few seasons, minki is a young label, looking to place themselves amongst the schedule of the loose and the limitless. 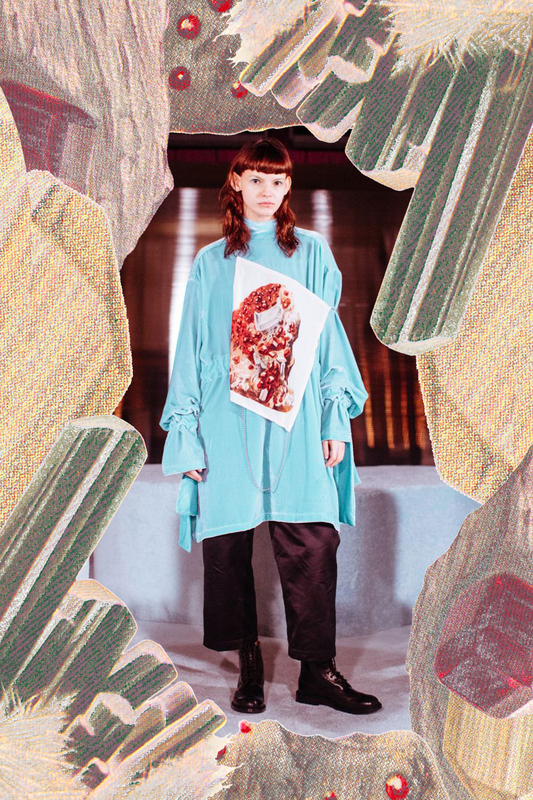 For the February 2018 collection, the shapes were familiar to the brand – slightly obtuse, generous silhouettes – but with a glitch offering in oversized pixellation cut in fabric and the TPP printing of interstellar cosmic rocks poured over poplin and slung upon blue velvet. A juxtaposition of luxurious proportions and styling against themes of technological advancement and the beauty of outer space – the sort of woman entranced by worlds of complete mystery against the familiarity of the arenas she calls her own. The focus on colour cemented a synchronicity within the work of Think Positive Prints and minki – minki a man of colourful leanings, TPP a vibrant celebration of talent and technology. The theme of this season’s collection – an exploration of who has been the most sophisticated creator, nature or man? – played in both territories. 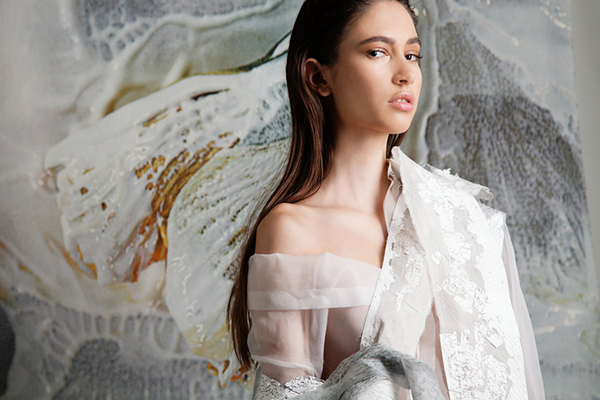 From the future of digital fabric innovation to the celebration of organic formations, minki contemplated on how various mediums can communicate with one another. Post-showcase, minki discussed the ethos, drive and definitions behind the brand: what makes its wheels turn; what makes its mind tick. Minki was founded in 2014. The first official collection released was AW15. How would you summarise minki in 3 words? Who is the minki woman? A woman who is aware of her surroundings and is free spirited. How do you try to capture this in your designs? I would like to think the minki woman loves nice clothing and to be different, but she is also a grounded person who loves a sense of realness. Whatever decision takes place in the design process we make sure she is that. What are the most important factors that come to play when creating your collections? New combination of textures and colours. You worked with Think Positive Prints this season – how did they help further the feeling of the collection? It really helped with the storytelling. We had colours and woven patterned fabrics to hint the theme but the prints really helped bringing out the plot. What are the benefits of digital print for you? When handled properly, it maximises the flexibility and possibility for printing on more unconventional fabrics and really bring out the beautiful colours and details. What role does colour play in your collections? Colour plays a huge part in the brand. I love to balance unconventional colours into something desirable for customers. How are you bringing elements of sustainability into mini? We do not use fur or leather. We are also working this company called Higher, founded by my friend Sara Arnold, which allows people hire our selected favourite pieces from past seasons. What plans are in the pipeline for minki? Our own online retail platform and to really push the quality of our samples to perfection. What was the last thing that made you excited in fashion? The last thing that made me really excited was watching the new Dries Van Noten documentary in the evening over a bottle of wine and then receiving all the new season’s fabric samples on the next day!